I recently had the opportunity to go fishing with my dad and father in law. We had been trying for a while to make time for a trip out together and after carefully watching the weather forecast we picked a day just before Father's Day to do some much-needed fishing. Venturing out on the waters of Sparrow Lake in a boat rented from Bayview Wildwood Resort, we were determined to catch fish. We were on the water by 7:15am and had cast our lines by 7:20. Throwing every possible lure at the fish, we casted for hours, trying different weed beds, shoals, drop offs, and sunken logs with hardly any luck at all. We had a few bites and a few very small perch follow lures in but nothing that resulted in a fish being landed in the boat. The sense of frustration and discomfort from the days heat was starting to take its toll on us. At one point we even tried to net a fish that was a foot beneath the boat was we drifted by but it quickly retreated from our presence. My dad and I had only been out once before this trip in the last few years so I was really hoping he would catch something. He let us know that he was about to call it a day and was trying his last "lucky" lure - the "Wobblin' Minnow," when he got a hit. After a quick fight he landed his first bass of the season (and actually first one in a few years as he doesn't have the time to get out fishing very often.) After he released his fish, I quickly had a hit but was unable to land the fish. Just as quickly as I lost one my dad hooked his second. After hours of trying it seemed the fish had finally decided they were hungry. While the action didn't last long, it was long enough for us to remember why we enjoy fishing so much. My father in law and I went back empty-handed but my dad ended a several year-long drought and was happy which is all any of us could ask for. We were able to relax and enjoy each others company and learned that next year we leave my dad at home but take his "Wobblin' Minnow" with us. 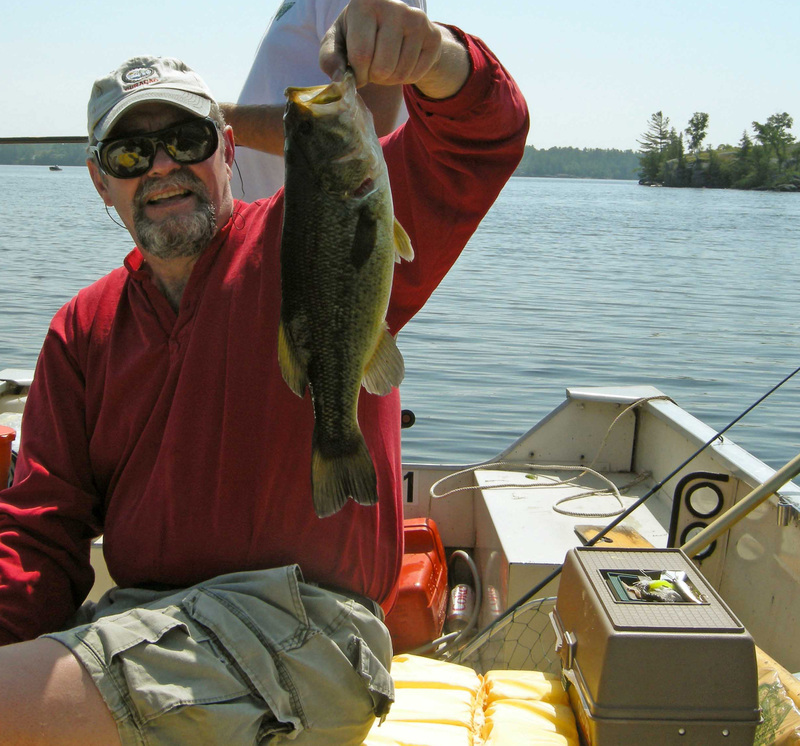 Ontario has so many great fishing opportunities and if you enjoy relaxing while casting a line please check out some of these resorts: Sand Beach Lodge, Sunny Point Resort, Pleasant Cove, Southview Cottages and Shamrock Lodge to name a few. If you hook into a nice sized fish be sure to enter the Resorts of Ontario Big Fish Competition.